One is Krishna Hall ( Big Hall ) . 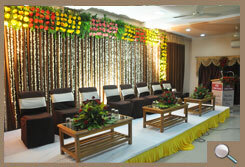 Krishna hall is having the capacity of 200-250 persons , and all accommodate easily at a time. Second is Ovi Hall ( Small Hall ) . OVI Hall, is having a capacity of 30-40 persons at a time. Both the halls are with AC and well ventilated.
" 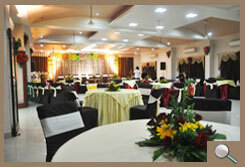 All types of functions arranged here like birthday parties, kitty parties, conference, get together etc... "